Álvaro Álvarez Elena had to move to Krakow to lead the newly established office of SeproTec Multilingual Solutions in the Polish city. 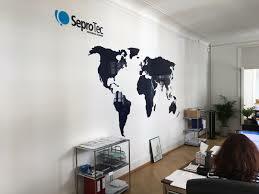 As Executive Director of SeproTec in Poland, he said manages the operations of the Krakow production center and oversees and executes SeproTec’s global sales strategy in the country. “[So] I have moved to Krakow; we understand this role cannot be done remotely,” he told Slator. “The Krakow office set up is part of our international expansion plan.” He reports directly to Juan Julián León, CEO of the Madrid-based language service provider (LSP). Álvarez, who studied at the Universidad Complutense de Madrid and holds a Degree in Labor Relations, joins SeproTec from L’Oréal Luxe, where he was area retail manager from 2015 to 2018. He also worked at Musgrave, Ireland’s food retail and wholesale company. He is, however, not a complete stranger to SeproTec as he had worked at SeproTec for four years as a sales manager 12 years ago. “I have always kept in contact with SeproTec, and somehow I have witnessed the changes in the language services industry,” he said.